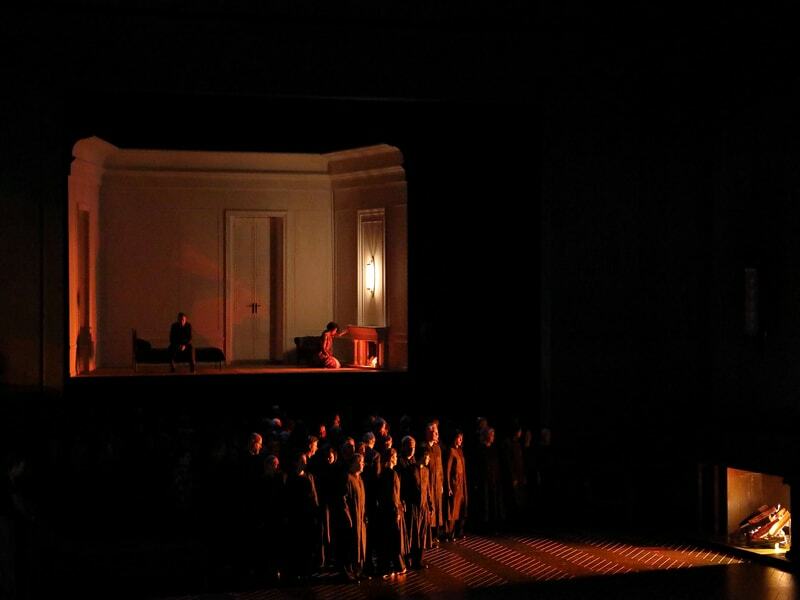 Bavarian State Opera’s new production of Otello (seen Nov. 28th) would seem to have all the ingredients for a compelling take on Verdi’s distillation of Shakespeare’s tragedy: top soloists Jonas Kaufmann (Otello), Anja Harteros (Desdemona) and Gerald Finley (Iago); beloved General Music Director Kirill Petrenko in the pit; superlative Bayerisches Staatsorchester, Chorus and Children’s Chorus; Director Amélie Niermeyer, whose new interpretation focuses on Desdemona’s plight rather than sympathizing with the title character. 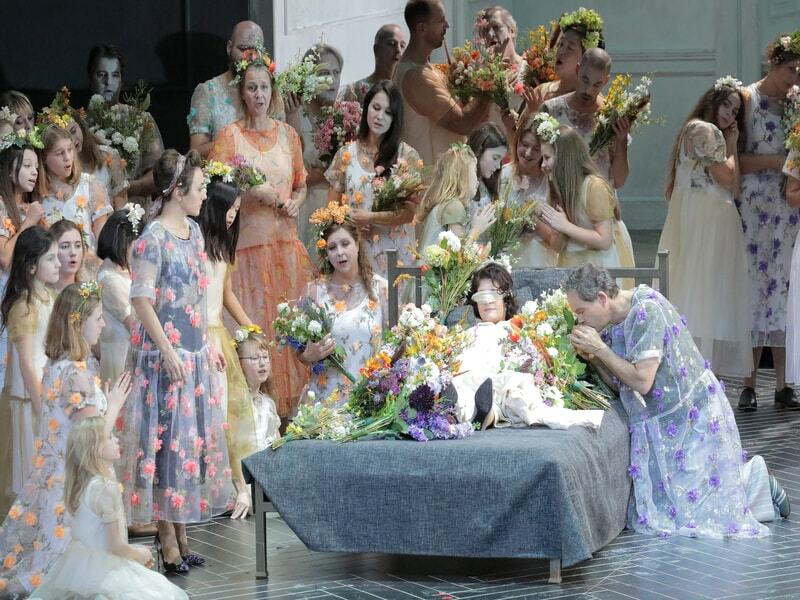 It was owing to Petrenko’s leadership that the performance was a triumph. The conductor literally danced on the podium, inspiring clarity of detail — or sublime force, depending on the dramatic requirements. The warm sounds emanating from the pit rarely overwhelmed the singers, leaving room for listeners to delight in the contributions of individual sections and instrumental solos. Canadian bass-baritone Gerald Finley was the evening’s vocal star. Many feared the so-called ‘lieder specialist’ might be overwhelmed by such a dramatic role, but in this house, with this conductor, he displayed no vocal difficulties. In fact, his vast experience with the subtlety required by lieder repertoire did him great service; he sang the entire role as if it were a song; vocalism functioned to illuminate the text. As a result, his vocal risks —straight-tone singing; extreme pianissimi; parlando effects — all served to delineate a twisted personality whose sole purpose is to bring about Otello’s demise. Even when singing in what some might perceive as falsetto (when a singer doesn’t fully engage his breath support), Finley’s sounds were organically connected to the rest of his vocal production and therefore, filled the hall effortlessly. Likewise Anja Harteros , a practiced Verdian, used her bright, rich tone to illuminate Desdemona’s plight, going from loving wife to wrongly accused adulteress. Problematic issues, however, were experienced around her diction, which lacked clarity and point, to say nothing of the great liberties she took with the score, especially the lingering fermate (pauses) and momentum-sucking rallentandi (slowing down). These became especially jarring in the great love duet that ends Act I, as well as the grand, sweeping line launching the Act III concertato (“A terra!… sì…ne livido fango”). In such a derailing of musical momentum, she was, alas, joined by her Otello, Jonas Kaufmann. The celebrated German singer has, of course, been lauded as the role’s next great exponent. 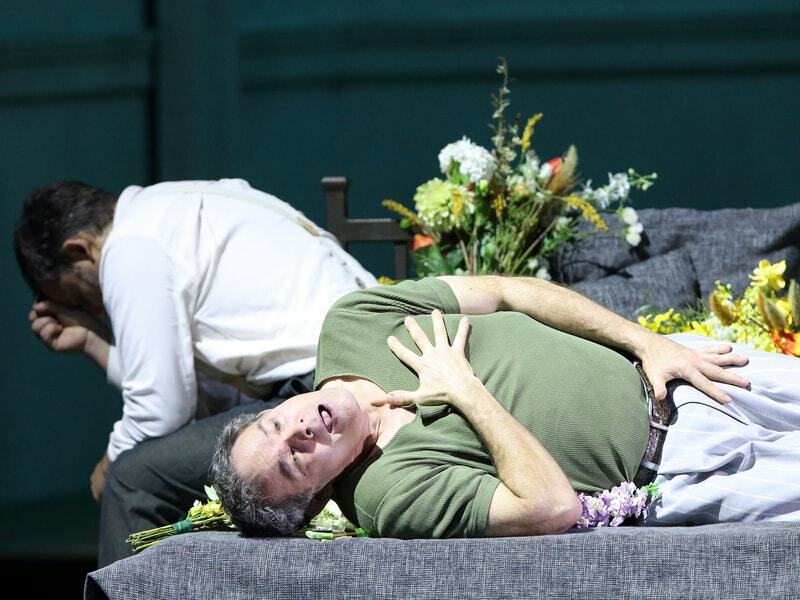 Kaufmann’s opening “Esultate!”—the ultimate test in vocal fortitude for any dramatic tenor—pinned the audience to their seats, so penetrating, triumphant and gob-smackingly beautiful was the sound. One hoped the rest of the evening might be as compelling. However, almost immediately, we were subjected to his micromanaging of quiet, piano tones to such an extent that that one lost track of the overall musical phrase, forcing Petrenko to put a brake on the proceedings. The quality of these soft tones was even more disconcerting; they sounded disembodied, completely detached from the more robust sounds he is capable of, only audible when the orchestra was at its quietest. Such vocal eccentricities might have been easier to accept had Kaufmann’s dramatic interpretation been more compelling. Whether his choice, or the director’s, his Otello hardly started out as a strong leader. With a physicality lacking commitment and half-hearted gestures, his descent into jealousy and suspicion seemed too abrupt. Kaufmann was not helped by GI-Joe style costuming (by Annalies Vanalaere) that connoted the position of Private instead of General, reflecting the director’s desire to examine notions of power and intimacy. The neutral design palette (gray, ecru, black and white) decorates a set which offers variations on Otello and Desdemona’s bedroom. 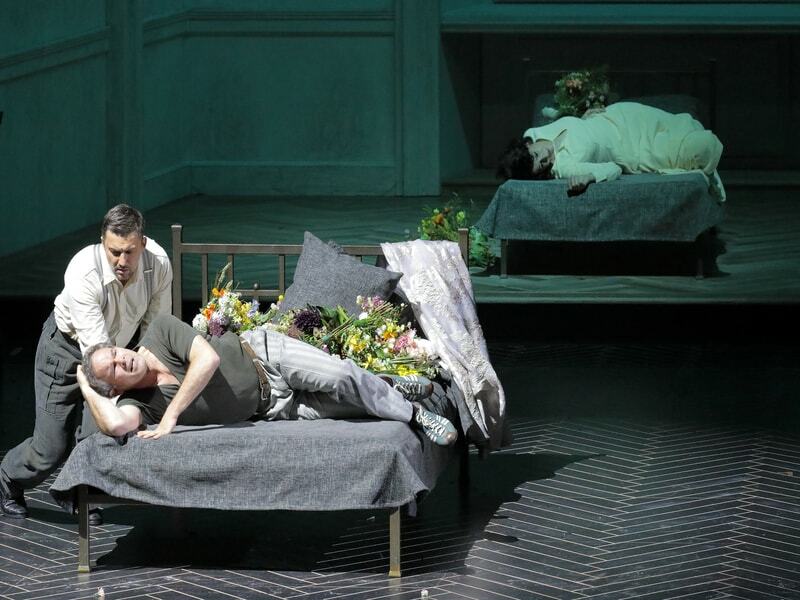 At certain moments, like the Act III concertato, this ‘bedroom’ setting is projected on a scrim, spins around, advances and retreats to signify the chaos of this relationship and its effect on the greater society. The setting is nondescript, but offers the potential of a canvas on which to illuminate the iconic tragedy. Yet the director makes it impossible to distinguish the hierarchy of this society, robbing the relationships of the tension they require to move the drama forward in a meaningful way. Iago sports pajama-like, wide-leg trousers and a t-shirt throughout. Otello’s uniform seems more suited to a low-ranking soldier. In stripping away all social context, Niermeyer offers her singing actors, and the audience, little clue as to why Iago’s hate would force him to incite Otello to murder his wife. Indeed Finley works magic with what he is given, but comes off as little more than a highly-disturbed social misfit who happens to have access to his leader. Verdi’s late works, Otello and Falstaff, are as close as late 19th-century Italian opera came to Wagner’s through-composed Gesamtkunstwerks where the drama begins with the orchestration, into which vocal lines are seamlessly knit. In Munich, half of this equation worked to perfection while the other was decidedly at odds. As for the drama itself, in order to give Desdemona more agency, Niermeyer interprets the title character as being damaged from the start. Iago required so little effort to break Otello that all the subsequent plot machinations were merely a matter of form. This felt like another admirable attempt to reclaim a 19th-century opera heroine, which may sound good on paper, but in practice, is incredibly difficult to achieve. Opera Canada’s March issue will include a feature article dealing with this very timely topic.